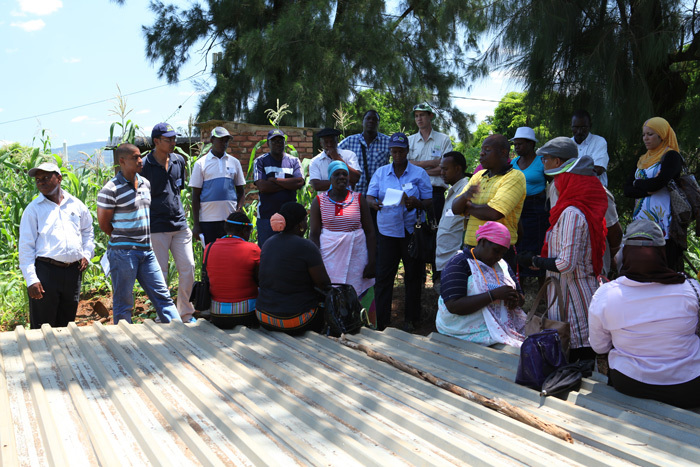 South African workshop a big success for participants and Limpopo Department of Agriculture! A week long workshop held in Polokwane and Thohoyandou, South Africa, last month has increased the communication and extension skills of the participants and helped the Limpopo Department of Agriculture re-focus some of their programs being delivered to their small holder farmers. The workshop aimed to expose the participants to a wide range of principles and examples of water use systems in small scale agriculture. The intention was to stimulate new ideas and cross-learning that will help participants identify planning and extension techniques and relevant technology that can be used in their country to enable a higher rate of adoption. As part of the workshop we visited three communities and an independent farmer in the Vhembe district to see first hand the challenges and successes in improving food security and income for their families. Chairman of the Palmary vill irrigation scheme sharing their successes and challenges with the participants The group looking at maize under a 'high tech' "floppy" irrigation scheme at Mbahela Cooperative. One participant identified Maize Lethal Necrosis in the crop. A new disease for South Africa. The team in South Africa was made up of Joe Ramaru and Oliver Gundani from PICOTEAM Southern Africa, Peter Fitzgerald, University of New England, and myself. A huge thank you goes out to Freddy Mudzielwana and his troops from the Limpopo Department of Agriculture for being so open and helpful, the communities of Palmary vill, Mbahela and Tshikonelo, along with independent farmer Elijah Mphaphuli for sharing their knowledge and experiences with us in such an generous way. Tshikonelo farmer discusses how she harvests rainwater for growing vegetables during the dry winter months.